What is the 9 in Whole9? We talk a lot about nutrition on our site and in our seminars, but that’s just one aspect of our program. 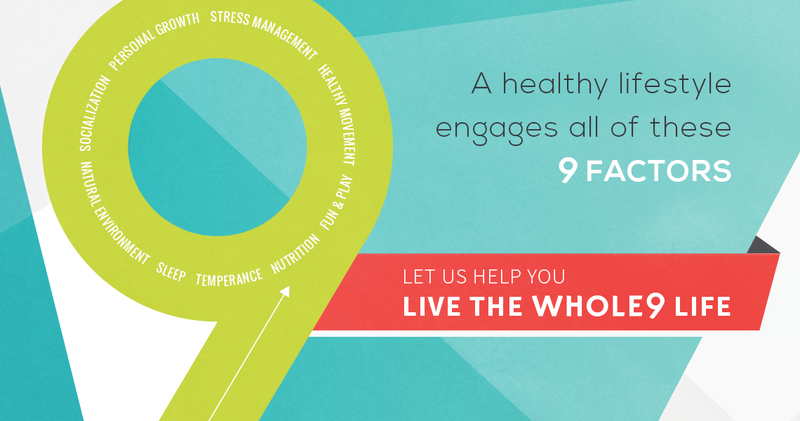 The ‘9’ in Whole9 comes from these 9 factors, which we believe are all important for optimal health. Our 9 Blog features all of our original articles, addressing various aspects of each of these factors (and a whole lot more. Am I supposed to count calories? How will I know if I’m eating enough? We don’t think weighing, measuring or tracking your intake facilitates a healthy, sustainable relationship with food. In addition, folks often override the signals their body is sending them (eat more!) because they get so stuck in the numbers (calories, blocks, grams or points). When you’re eating Good Food, you don’t have to track your intake. The nutrients in the foods we recommend, coupled with the healthy hormonal responses these foods promote, send accurate satiety signals to your brain to tell you when you’re hungry, and when you’ve eaten enough. Your body knows how much you should be eating better than any calculator you pulled off the internet – and when you’ve been eating Good Food for a while, you can trust the signals your body is sending you. If you’re brand new to Paleo, use our meal planning template help you figure out portion sizes and meal frequency. After a few weeks, you can let your energy levels, hunger, mood and performance in the gym or in your sport help you decide whether you need to eat more. How do you get enough calcium on a Paleo diet? Review our What About Calcium article for a detailed explanation of building strong, healthy bones on a Paleo diet.